Aastha is a unique hospital - the North India's first and only 70 bedded specialised Geriatric Hospital, which provides state of art medical facility to the old, frail & sick senior citizens since its inception in 2005. Aastha has an entirely holistic approach to healthcare, aiming to help patients lead as confident, comfortable and fulfilled a lifestyle as is possible after a prolonged illness, accident or surgery. At Aastha we have A caring atmosphere, A listening ear, Relaxation, Reflection, A break for carers, as well as support for patients, relatives and friends that helps in speedy recovery of patients and provides relaxation to the caregivers. Round the clock Assistance in Activities of daily living. Meals for four times in a day. Physiotherapy, Rehabilitation & Occupational Therapy. 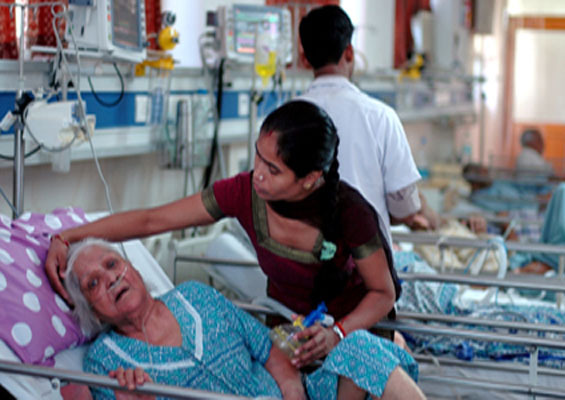 Who can benefit from Aastha Geriatric Hospital ? Patients who enjoy the hospital's high level of care on day-to-day or monthly basis might be elderly suffering from acute medical illnesses, terminally ill cancer patients, physically disabled, stroke victims, patients in need of a rehabilitation programme after an illness or following fracture and joint replacements. Patients needs and their homes are assessed by staff, and help and advice is given. Staff at the hospital are all extremely highly qualified professionals, with specialism's in many areas. Aastha has an entirely holistic approach to health care, aiming to help patients lead as confident, comfortable and fullfilled lifestyle, after an unforseen accident, illness or surgery. B-52, J-Park, Mahanagar, Lucknow, Pin- 226006, Uttar Pradesh, India. © Copyright 2014. All Rights Reserved by "Dev Info Solution Pvt. Ltd."